We offer lessons in small groups for all levels and riders of any age. We tailor lessons to suit your specific requirements and have a number of quality horses and ponies for you to choose from. Lessons last 1 hour. 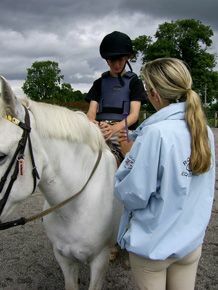 Young Riders, 4 years + can take a lead-rein lesson - please call us on 087 2822358 for more details. We are now taking bookings for 'Term Horse Riding' - that's a block of 8 lessons running consecutively. Lessons continue in all weather in our small indoor arena and with horsemanship and stable management training. Beginners and nervous riders are very welcome. All riders must bring their own well-fitting BHS Approved Helmet, Back Protector and Riding Boots. (We will not lend equipment for health and safety reasons). We also recommend a warm sweater, rain jacket, gloves, jodhpurs, and half-chaps if wearing jodhpur boots. 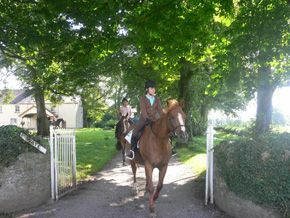 We hold Pony Camps every Mid-Term Break and during the School Holidays. Usually lasting 3 days from 10am to 2pm, our Camps are aimed at 4 to 14 year olds. 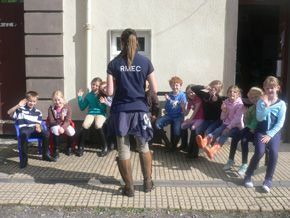 Children have Riding Lessons, Stable Management training, BHS Progressive Tests and Pony Games and much more. Pony Camps are themed according to the season – at Easter there is an Egg Hunt, at Halloween Fancy Dress, and of course Santa and his reindeer/horse visit with a sack full of presents at Christmas. Children are fully supervised all day (early drop off and later collection can be arranged), we have lots of ponies to choose from. 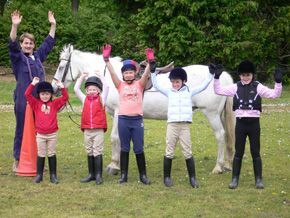 Residential Pony Camps also available for older children. All Pony Camps end with ‘Prize Giving’ and a rosette – we believe it is important that everyone is rewarded for their achievement. During the School Holidays we take foreign students for residential 'English & Horse Riding Courses' - during this time we also offer 'French & Horse Riding' to a small number of Irish and English students from the age of 8 to 17. The students ride in the morning and take French tuition in the afternoon; they also have the advantage of socialising with our visitors from France - putting what they learn in their lessons into practice. Please email Amanda on info@rmec.ie for more information and prices or call 087 2822358.